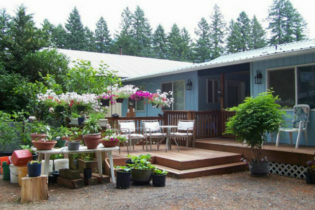 Welcome to A Hidden Haven Cottages located in Port Angeles, WA close To the Olympic National Parks and the beaches. 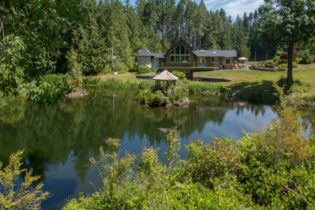 Nestled in the lush forest at the foothills of the Olympics, is a secluded 20 acre hidden haven, called A Hidden Haven Bed & Breakfast Inn & Cottages in Port Angeles, Washington. The key words to describe our inn are Romantic ~ Luxury ~ Nature ~ Seclusion, because here you will find a casual environment full of enchantment and wonder. From the picturesque gazebo at the center of the pond, you will be dazzled by the beauty of the surrounding forest reflected in its waters. Enjoy the abundance of waterfalls, ponds, gardens, plants and wildlife. Our Port Angeles west location is a naturalist’s paradise and a delight to birders. Some guests report seeing more birds at A Hidden Haven than in the Olympic National Park, which is reported by Birder’s World to be a birding hotspot on the Olympic Peninsula. Your hosts, Chris and Jodi Jones welcome you. Come take in the majestic panoramic view at this Cascades Bed and Breakfast in peaceful Leavenworth, Washington. Resting on 3 quiet country acres, the Autumn Pond Bed & Breakfast will welcome you with rustic charm and warm hospitality. Befriend the ducks who live in our private pond - connect with nature and get away from the daily grind. 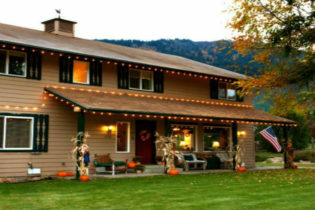 Welcome to the Autumn Pond Bed & Breakfast in the Bavarian Village of Leavenworth, Washington. The inn’s location is perfect for a brisk walk to downtown or a quiet evening stroll to the Ski Hill area where you can enjoy magnificent wildflowers. Unwind in a wooden swing by our pond and watch the birds in their natural setting. There are 6 wineries nearby, as well as festivals, performing arts, and a wide variety of outdoor activities. On the majestic basalt bluffs overlooking the peaceful Walla Walla River, Cameo Heights Mansion rises regally over a lush 400 acre orchard and vineyard. This distinctive French country resort, created by Deanne and Alan Fielding as a destination retreat for couples, features seven spacious and luxurious suites with private baths, spa tubs, fireplaces, veranda views and sumptuous dining. 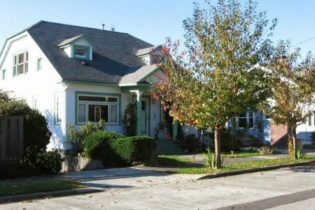 Situated midway between Walla Walla and the Tri-Cities, Washington, Cameo Heights Mansion offers local and out of town guests a unique Bed and Breakfast experience in a country setting surrounded by orchard and vineyard and secluded from the din and lights of the city. Ideally centralized, this site connects the celebrated wineries of Walla Walla wine country with the Columbia Valley and the up and coming Red Mountain wine appellation. Pampered luxury is the daily experience at Cameo Heights. Guests relish swimming and sun bathing in the outdoor pool with the waterfall (Closed November-March), soaking in the hot tub (open year round), roasting s’mores on a flickering outdoor fire pit, playing ping pong in the hospitality suite, challenging each other to an old-fashioned game of horseshoes, watching in-wall high definition TV’s, or enjoying a movie in the spacious theatre room. Reminiscent of an old world country villa, but in the Tuscan hills of Touchet, the Mansion offers an escape from urban congestion with all the luxuries of the privileged. As a destination resort, we have full dining services for our guests, from breakfast, to lunch and fine dinners prepared in our “chef’s table” kitchen. Located less than 10 minutes from downtown Seattle, Chittenden House Bed and Breakfast is the perfect B&B for relaxing and enjoying quiet serenity away from the hustle and bustle of the city, with easy access to downtown via West Seattle Bridge or King County Water Taxi. Unwind and enjoy the view of Puget Sound on our back deck or sit in our lovely gardens or "sun room" area after a busy day of sightseeing or shopping. 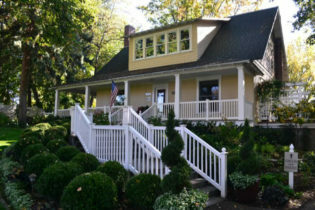 Chittenden House Bed & Breakfast, located in the heart of West Seattle, allows you to escape the hustle and bustle of downtown Seattle, WA. Come enjoy gorgeous views of Puget Sound while staying just ten minutes from downtown Seattle. Alki Beach and Lincoln Park are both just minutes away. Chittenden House Bed & Breakfast is less than 10 miles from downtown Seattle, close to Century Link Field and Safeco Field stadiums and is within easy access to downtown via West Seattle Bridge or King County Water Taxi. This European style B&B, located in a 1926 Craftsman home, offers romantic and timeless accommodations and the service is friendly and attentive. Relax and enjoy the view of Puget Sound on our back deck or sit in our beautiful gardens or “sun room” area after a busy day of sightseeing or shopping. Luxury linens, in-room fireplaces, claw foot bathtubs and wireless Internet await you. Welcome to the Conley Suites Bed and Breakfast located in the heart of Yelm, WA. We Offer 21% discount for weekly rates and 49 percent discount for monthly stays! Our Bed & Breakfast is designed with you in mind. We’ve tailored each room, our hospitality and amenities to make your stay is as enjoyable and relaxing as possible. We hope that our attention to detail and desire to pamper you shines through each and every moment of your stay. We offer a well designed, comfortable common space to fit your taste and budget. We are small, with a calming atmosphere for our guests to enjoy, both in and out of their room. Our rooms offer the elegance, class and comfort will be hard to match at your local hotel. With a mixture of old, new, you’re sure to enjoy any stay with us, whether you’re here on business or for some fun. And all of our beds offer you the luxurious pillow top comfort, so you can ensure that you’ll sleep soundly. All of rooms have an air conditioner in the summer and electric fireplace all year around with or without heat to enjoy. A private bathroom, TV, and Wi Fi is a must is located in each room. The suite consists of a bedroom and living room with views of the lake and a full guest bathroom. Amenities include a hot tub, a fire pit under a gazebo on a deck by the water, two kayaks, a dock for swimming and fishing, plus lounge chairs for relaxing. We serve a large continental breakfast of warm croissants and jam, fresh fruits, yogurts, granola and milk, orange juice and hard-boiled eggs. The bedroom has a queen-sized bed, a Keurig coffee maker, soft robes, slippers and an electronic massage cushion. The living room has a private entrance with the hot tub right outside the door. It has two cushy chairs, a loveseat, cable tv, WiFi, CD and DVD players, games and a wide selection of books. There is a large computer desk and a small table for dining indoors, with lower and upper decks for outdoor dining. The bathroom has toiletries and a hair dryer. The suite overlooks the water from the midpoint of the shoreline, giving a broad vista of the lake and surrounding area. 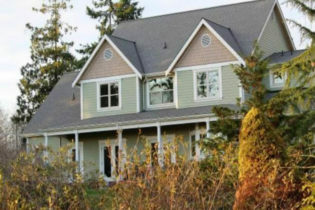 It is situated in the heart of Woodinville wine country in a quiet neighborhood on a dead-end street. Facing east, it offers a clear view of the sunrise, weather permitting. Though Seattle is 20 miles away, this rural setting has eagles from a nearby nest soaring frequently over the lake, which is filled with waterfowl and trout. Deer occasionally wander into the yard. We have lived here since 1978 and are pleased to welcome you to what is for us an enchanting spot. We hope your stay here is as conducive to your peace and enjoyment as it has been to ours. John, Beth and Harley are awaiting your arrival. Come home to Greenlake Guest House Bed and Breakfast in north Seattle. We are located right across the street from popular Green Lake. Downtown Seattle and the famous Pike Place Market are just a ten minute drive away. Greenlake Guesthouse is located in north Seattle Washington, across the street from Green Lake in a pretty residential neighborhood. 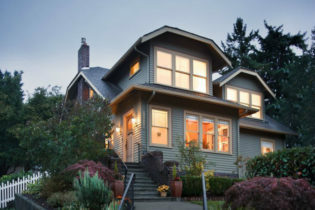 When visiting Seattle, come make yourselves at home in our 1920 craftsman style Bed and Breakfast. Our goal is to meet your needs perfectly whether you are a tourist, a business traveler, or are looking for a romantic getaway in the city. We are located in Seattle just across the street from Green Lake, with lovely views of the lake and park from most rooms. Get up for an early morning jog around the lake, or walk to nearby shops and restaurants. Comparable to Central Park in New York City, the park’s amenities include 3 miles of walking/biking trails around the lake’s perimeter, as well as tennis courts, swimming, boating, a theater, and a playground. Bicycle, roller blade, and boat rentals are available nearby. The neighborhood is a wonderful oasis in the heart of the city, near the University of Washington and the Woodland Park Zoo. 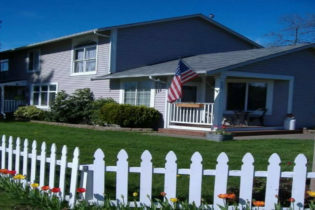 1906 Victorian Farmhouse, with beautiful covered porches and rolling lawns with huge shade trees, the Inn at Blackberry Creek Bed & Breakfast in Walla Walla, Washington is a great place to relax. You'll get to see all that Walla Walla has to offer with our convenient location, in close proximity to historic parks, quaint shops which line downtown Walla Walla streets, and award winning Walla Walla Wineries. The Inn at Blackberry Creek, a Bed and Breakfast nestled among pristine waters and wildlife in Walla Walla, Washington invites you to be our guest. Experience the best of both worlds by at once relaxing in a quiet country setting, while enjoying close proximity to boutique Walla Walla wineries, Whitman College, historic parks, and quaint shops which line our downton streets. Once a Victorian Farmhouse built in 1906, the Inn has been carefully restored to its original beauty. We invite you to feel at home by providing ample space to enjoy. Whether you enjoy an afternoon cup of tea in the dining room, or relax in the main floor gathering room in front of the beautiful fireplace, our wish is for you to be comfortable. You may also visit the upstairs alcove, a sun-lit space with stunning views. Take time to enjoy a good book, read the local paper, or browse through our collection of books on the local history of Walla Walla. This area also hosts a table, cards and a variety of games to entertain you. A natural spring forms a creek just behind the Inn, which plays home to a number of animals. It is not uncommon to sit on the patio and spot pheasant, quail, raccoons, owls, rabbits, squirrels, gold finches or blue jays. Whether you want to explore the creek area, pick wild blackberries in season or bird watch, The Inn at Blackberry Creek provides a quiet retreat for you to relax. The Inn is within short walking distance to historic Pioneer Park, which is a beautiful walk any time of year. 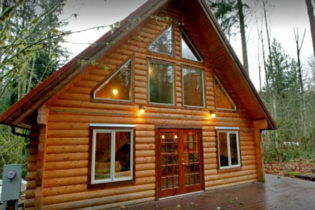 Monfort's Bed & Breakfast in Cougar, Washington is where you will find down home comfort close to Yale Lake and Ape Caves and Mount Saint Helen's Snow Parks. The Pleasant Ridge Bed & Breakfast is a quaint, locally-owned innt in Mount Vernon, WA serving farm fresh eggs with views of wildlife. Adjacent to hiking, water activities, wineries and the annual Skagit Valley Tulip Festival, there are plenty of activities for your enjoyment. 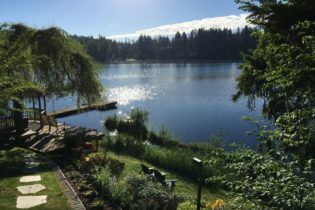 Situated in a quaint area not too far from LaConner, WA the Pleasant Ridge Bed & Breakfast in Mount Vernon offers a quiet getaway perfect for families, couples, and singles. Take a peak at our lovely rooms. We have everything to make your stay comfortable and relaxing. The Skagit Valley region offers a wide variety of sightseeing opportunities. Get out and take a look around! 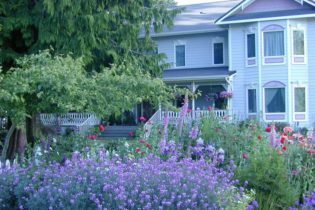 Welcome to the Sea Cliff Gardens Bed & Breakfast offering relaxing accommodations on Washington state’s Olympic Peninsula. Our inn is furnished with the finest collection of European antiques on the coast. Spacious and private guest suites have expansive views, fireplaces, and oversized bathrooms. Each spacious and private accommodation in our Sequim – Port Angeles inn is furnished with fine European antiques, has expansive views, a gas fireplace, and oversized private bathrooms. Most have either an indoor or outdoor hot tub. A full breakfast is included. Breakfast is served on fine china in an elegant dining room at 8:30 am – panoramic view included. Picnic breakfast-to-go is available for active early-starters, and fresh-baked cookies await your return each evening. Seven unique and sumptuous en-suite rooms await you, each with its own private garden and outdoor shower, view of the pastoral farmlands, Blue Mountains and private entrance. World-class gourmet breakfast and family-style dinner with your hosts and superb wines will build memories that last and make you want to return. Romantic Escapes, Golf Getaways, Food & Wine Pairing, Wine Blending Experience – check out our packages on our web site.